Unlike any arena ever built. From its signature spire and modern architecture to its public spaces and comfortable amenities, the Amway Center is an iconic destination to Central Florida and beyond. The Amway Center features a modern mix of metal and glass exterior materials and the spire serves as a beacon amid Orlando’s vibrant downtown. With a capacity of up to 18,500 depending on the type of even, the arena was designed to respond to its distinct urban setting while revealing the activities occurring within. 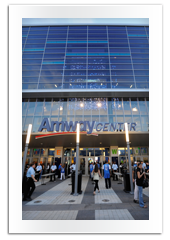 Bounded by Church Street, Hughey Avenue, South Street and Division Avenue, the Amway Center’s primary entrance faces north to Church Street, creating a natural extension of the nearby downtown entertainment core. The Church Street entry features a large public entry plaza connecting to the Amway Center’s spacious entry lobby. From the beginning, designers focused on creating a sustainable site; providing water efficiency; optimizing energy and atmosphere protection; conserving materials and resources; monitoring indoor environmental quality and health; and selecting environmentally preferred operations and maintenance. These elements combine to create one of the most environmentally friendly, high-performing professional arenas in the country. Inside the Amway Center, everything is new from the front row to the rafters. Bigger seats. Better sight lines. More amenities on every level of the building. Concourses are spacious, offering unique concessions and activities for kids and adults alike. Jernigan's Restaurant and the Ozone Bar overlook the event floor, and children enjoy spending time in the kid-oriented fun zone and retail store on the upper concourse. Technologically, Amway Center is one of the most advanced ever built, highlighted by the main scoreboard – the largest of its kind in the NBA. Measuring approximately 42 feet high and weighing in at more than 40 tons, its four primary video displays will be able to show high definition imagery in 4.4 trillion shades of color. Altogether, it’s unlike any arena ever built. It’s a world-class experience unlike anything Central Florida has ever seen. The Orlando Magic served as the developer of the Amway Center which will host major national events, concerts and family shows. Opened in the fall of 2010, the facility is owned and operated by the City of Orlando on behalf of the Central Florida Community. 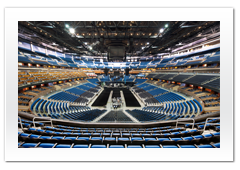 The Amway Center was designed to reflect the character of the community, meet the goals of the users and build on the legacy of sports and entertainment in Orlando. The building’s exterior features a modern blend of glass and metal materials, along with ever-changing graphics via a monumental wall along one façade. A 180-foot tall tower serves as a beacon amid the downtown skyline. At 875,000 square feet, the new arena is almost triple the size of the old Amway Arena (367,000 square feet). The building features a sustainable, environmentally-friendly design and unmatched technology featuring 1,100 digital monitors and the largest high-definition scoreboard in an NBA venue, and multiple premium amenities available to all patrons in the building. Every level of ticket buyer has access to: the Budweiser Baseline Bar and food court, Sugar Skull Rum Landing, Jernigan's Restaurant, Nutrilite Magic Fan Experience and Orlando Info Garden, STUFF's Magic Castle kid's zone and multiple indoor-outdoor spaces which celebrate Florida’s climate.